Here’s a brief description of the 15 legs comprising the Frosty Moss Relay to help your team start planning who’ll run when. 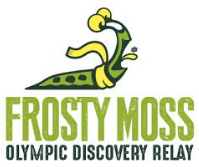 Participants will receive an in-depth Frosty Moss Relay guide closer to relay day. 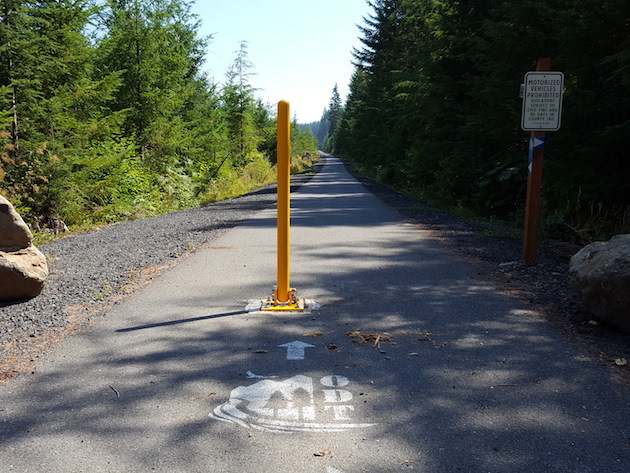 Paved legs follow the Olympic Discovery Trail, a multiuse path for runners, cyclists, walkers, and horseback riders. 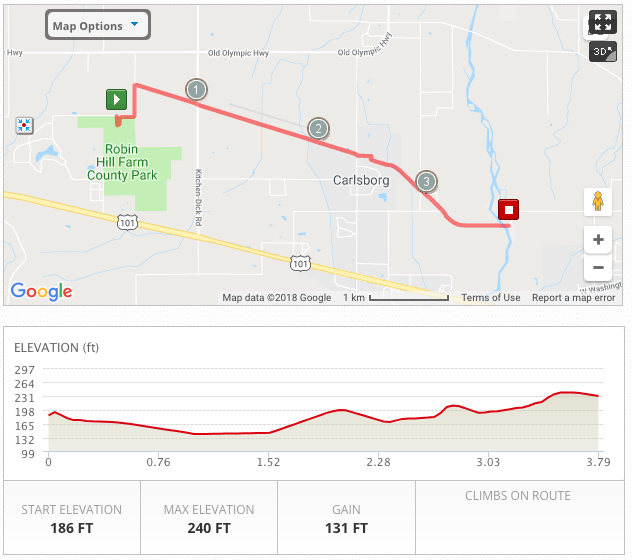 Relatively flat and fast, though you will encounter some rolling hills. Most of the ODT is separate from traffic, but it does share the shoulder with traffic in a few places. We’ve noted traffic situations in the descriptions below. 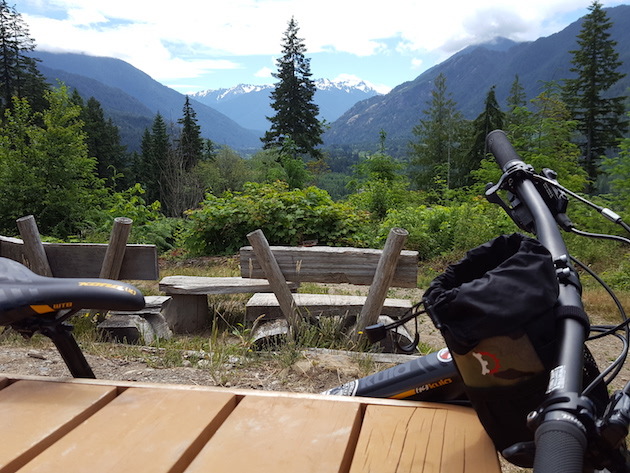 Unpaved legs follow the ODT-Adventure Route, which is flowy dirt singletrack. 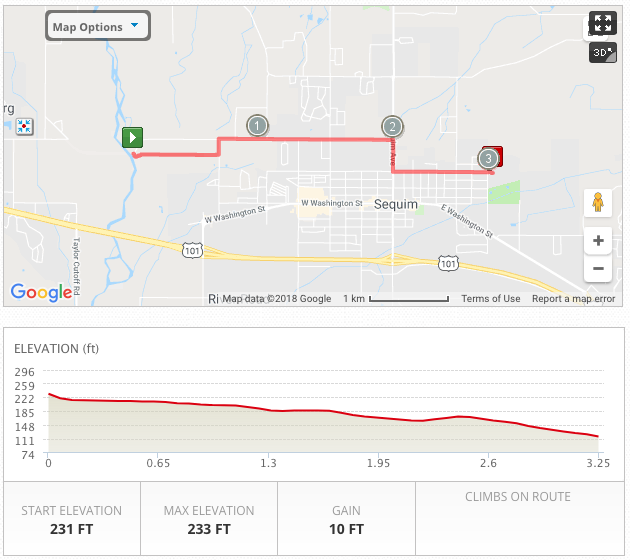 Not super technical, but definitely hilly. The Adventure Route’s long ups and downs will be a fun change of pace for your trail-happy teammates. DAWDLERS BEWARE! Teams must average a 12:00 pace or faster, including time spent at exchanges. 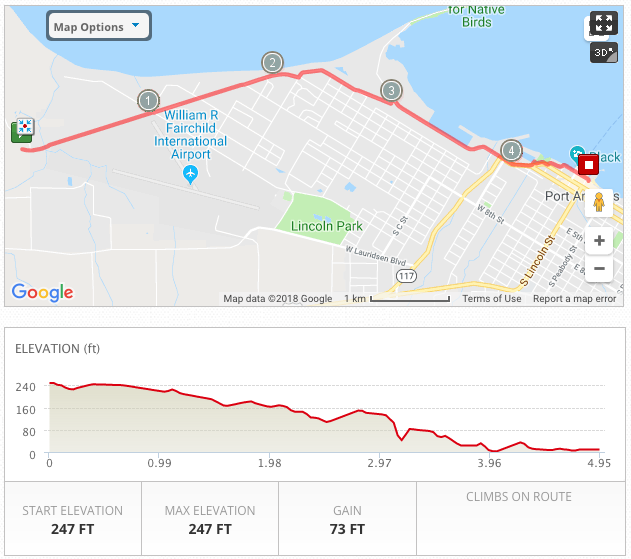 Teams arriving at Railroad Bridge Park (end of Leg 12) after 8:00pm will receive a “Go Directly to the After-Party” pass (aka DNF). Event directors reserve the right to pull teams from the course at any time for reasons of time, safety, etc. ROADS ARE OPEN: Traffic rules apply. Runners and team vans must use caution at all crossings, along shared roadways, and exchange points. 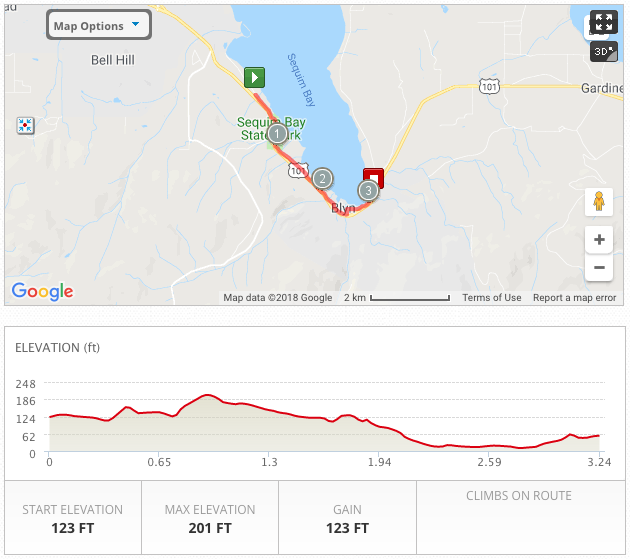 Bookmark the Frosty Moss Relay routes on MapMyRun. Distances are rounded to the nearest tenth or quarter mile. Click images and maps to enlarge. 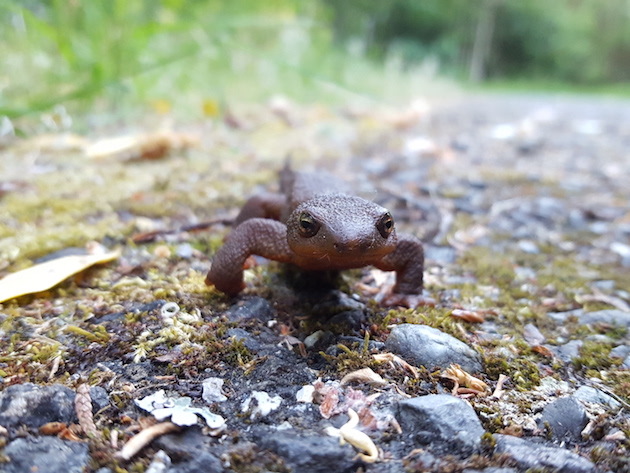 Surface: Paved ODT and 1 mile of shared Forest Service road. Highlights: Flat and fast. Sol Duc River views. Very, very green. The start line is the very western end of the completed Olympic Discovery Trail. Traffic Alert: Last mile is on shared road. Logging trucks have the right of way. Highlights: Flat and fast. 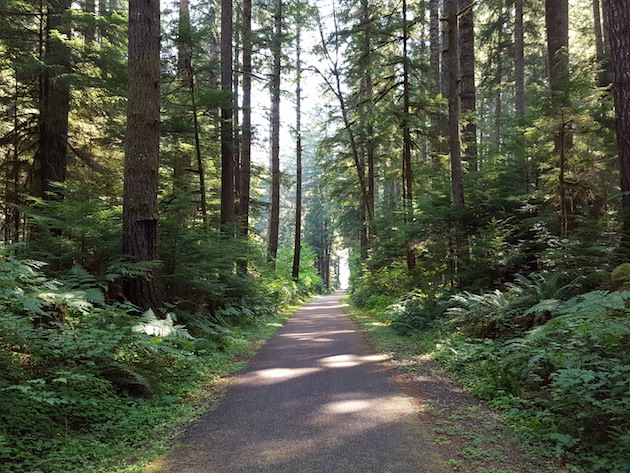 Buttery paved surface amid tall trees. Traffic Alert: This leg crosses HWY 101. Traffic rules apply. 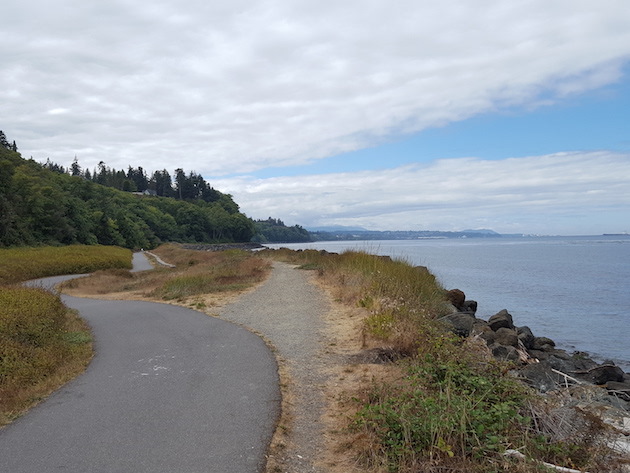 Surface: Mix of paved path, wide gravel regrade, and dirt trail. 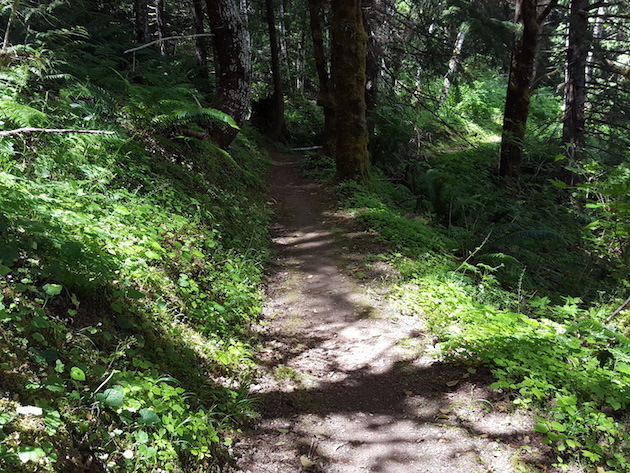 Highlights: The entire length of the ODT-Spruce Railroad Trail. Net downhill all the way. 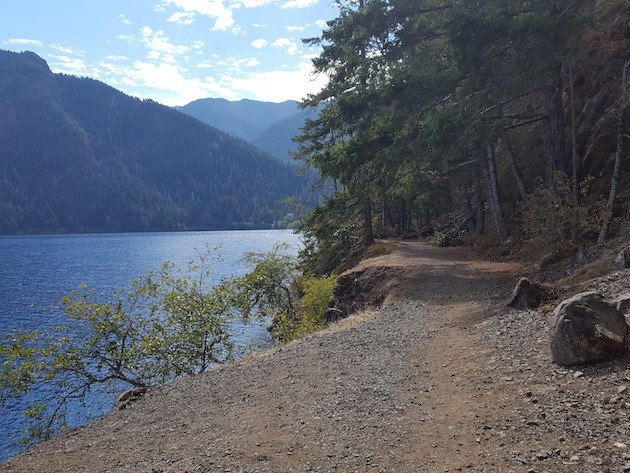 Run alongside Lake Crescent and through a restored railroad tunnel. Take time for a short detour to the bridge over Devil’s Punchbowl at either end of the tunnel. 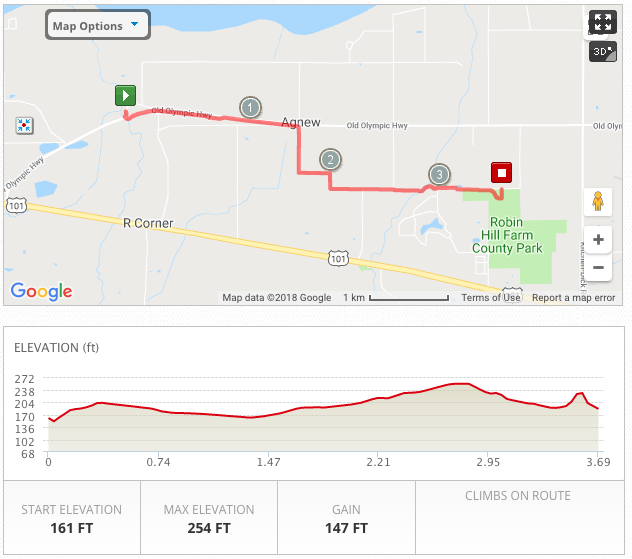 Surface: About 3 miles of gravel road (closed to traffic), then singletrack trail. 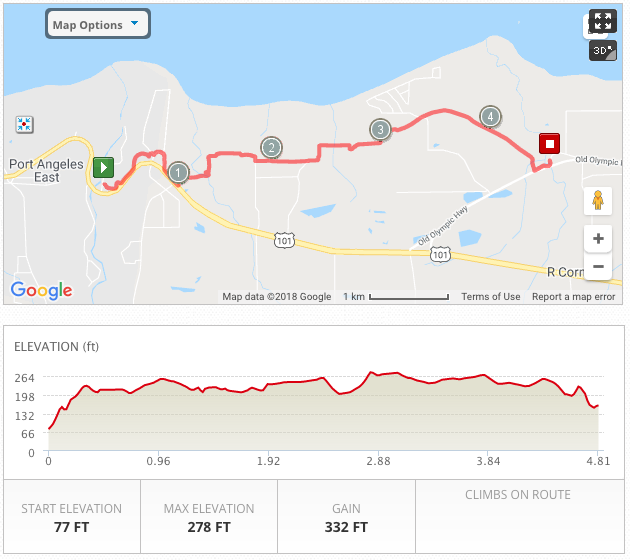 Highlights: East Beach to Joyce Access Rd. 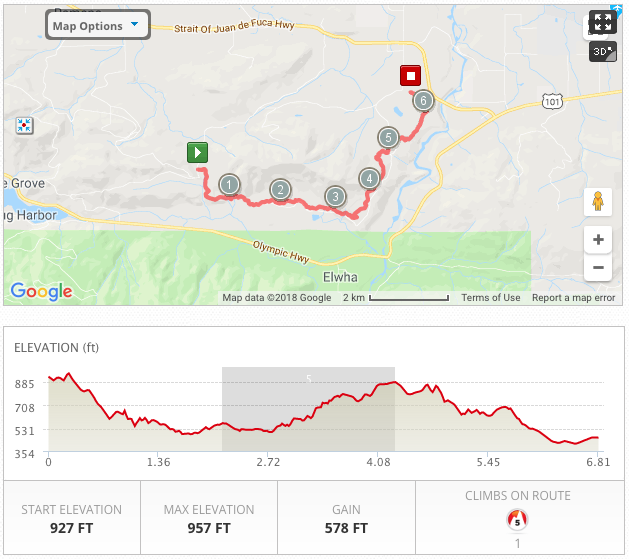 First leg of trail running. Lots of uphill on this one. Traffic Alert: Begin on East Beach Rd (~1/4 mile). Cross Joyce-Piedmont Rd near MP5. Highlights: Joyce Access to Eden Valley Rd. 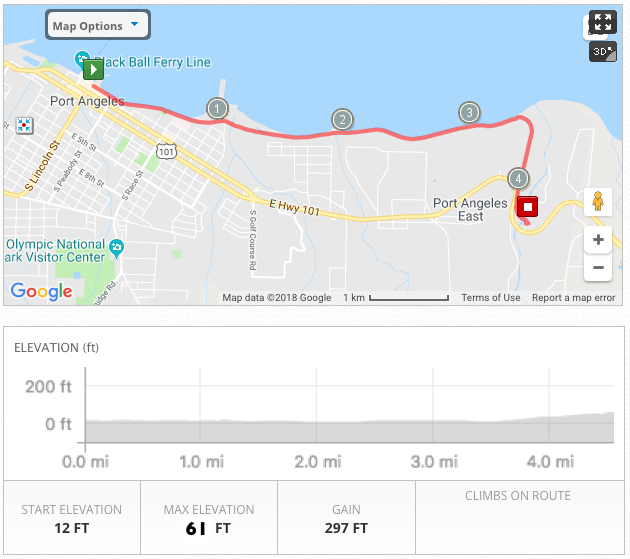 A local favorite for weekend runs, and the first half of the OAT Run half marathon. Dense, moody forest with occasional views to Vancouver Island. 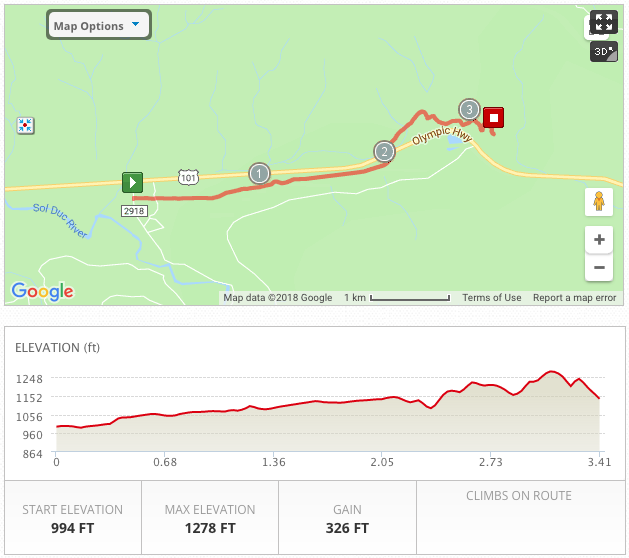 Fun-to-run switchbacks and lots of hills. 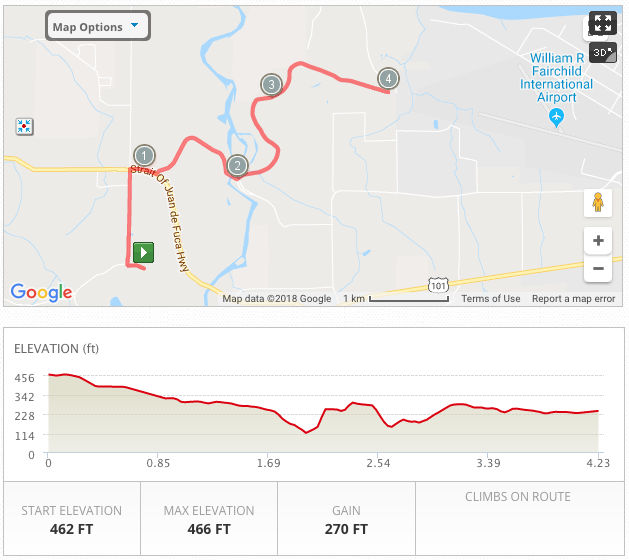 Highlights: Eden Valley to the Dan Kelly Lot, another local favorite. Starts with a lovely long downhill before climbing to the Living Room (see photo, giant benches with views of the Bailey Range) and ends with a fun downhill to the exchange. PS: Sorry about that last hill. 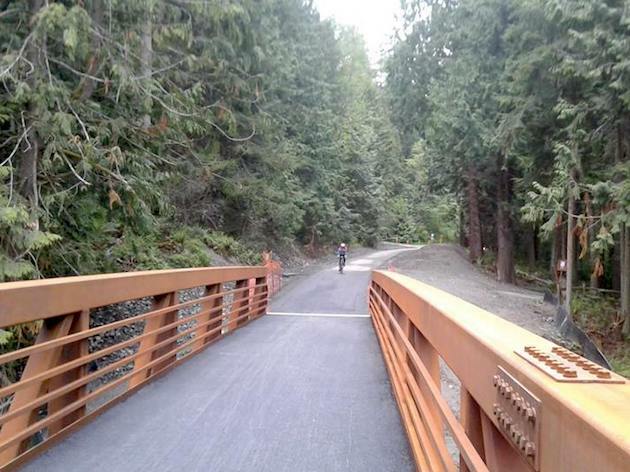 Surface: 2 miles along roadway, paved ODT (no traffic) at Elwha River. 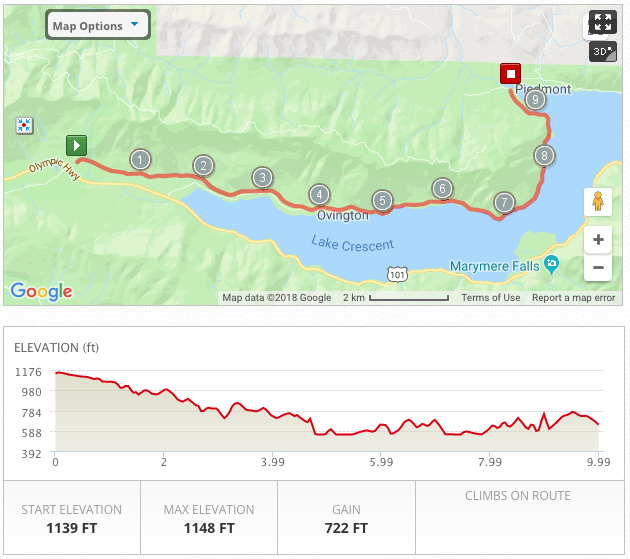 Highlights: Around mile 2, leave the road behind and enjoy the view from the bridge over the newly wild and free Elwha River. Get ready for Leg 7 with a viewing party of Return of the River. Traffic Alert: Run along narrow shoulder on rural roads and Hwy 112 in first 2 miles. Runner must cross Hwy 112. Watch for highway-speed traffic. Surface: Paved ODT, neighborhood streets, sidewalk. Highlights: Get into a speedy groove with a subtle downhill grade before the big downhill to the waterfront. Things get a little industrial for a few blocks before the relay exchange at city pier. Traffic Alert: Mix of shoulder, sidewalk, and ODT after MP2. Watch for course markings. 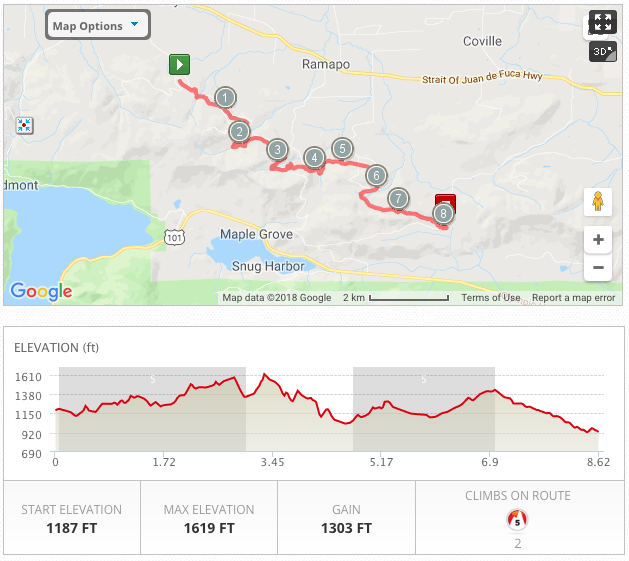 Elevation Gain: Not much. Very flat! Highlights: Pure Strait of Juan de Fuca goodness. 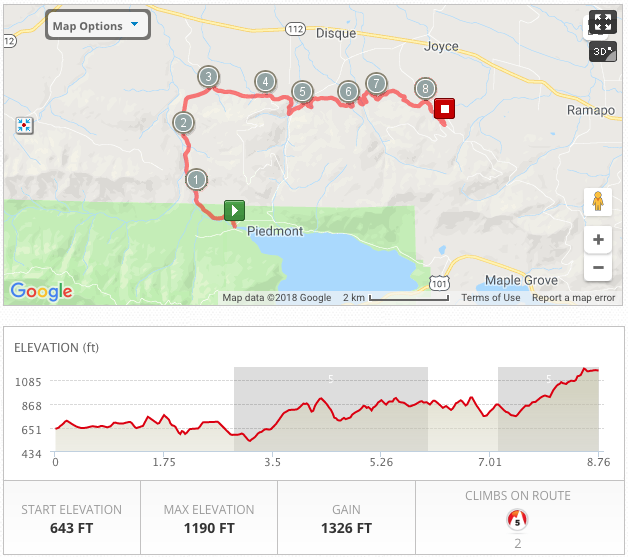 Never mind MMR’s elevation chart—we swapped it for the more accu-flat elevation from Strava. Watch for river otters! Traffic Alert: Watch for traffic at the street crossing after the Morse Creek trestle. Exchange point is in the parking lot on the other side. Highlights: Sorry about that big hill at the start, but there’s a great mountain view at the top! (And a bunch of public bathrooms at the rest area.) 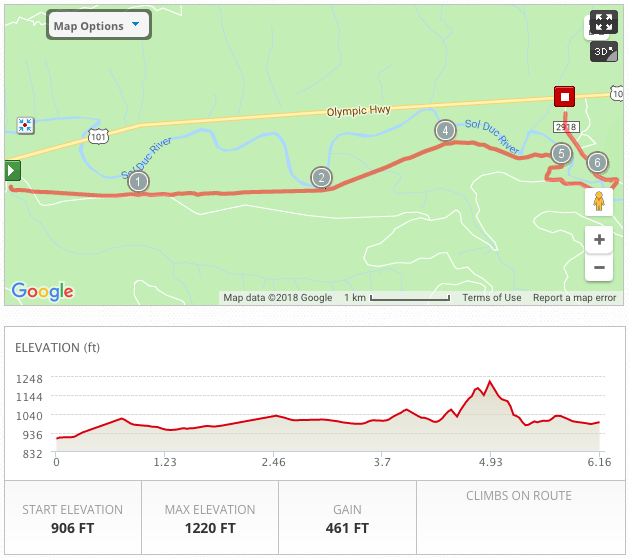 Oh, and that big down and up at the covered bridge, but after that it’s lovely rolling hills through the trees all the way to Old Olympic Hwy. 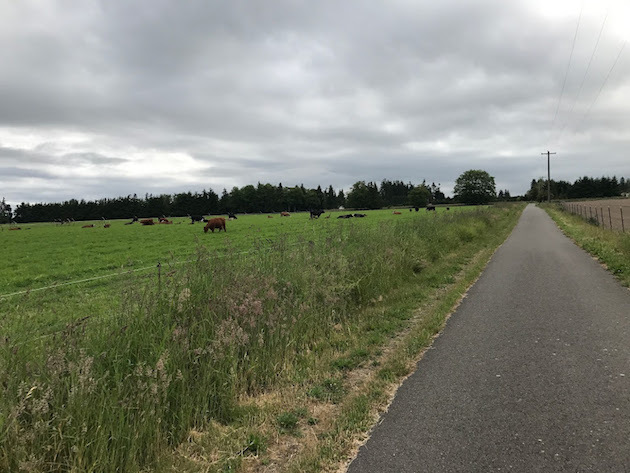 Highlights: Make up for lost time entering the flatlands of Sequim. Forest gives way to working farmland. Say hello to the cows. It’s usually warmer and drier out this way, too. Welcome to the rainshadow. 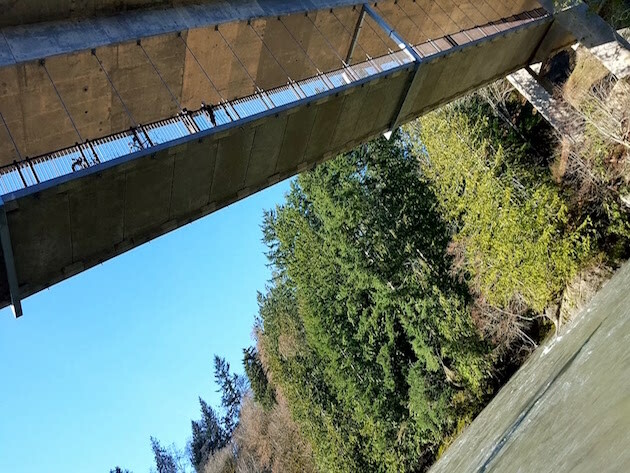 Highlights: In February 2015, a high-water event washed away the Dungeness River trestle. 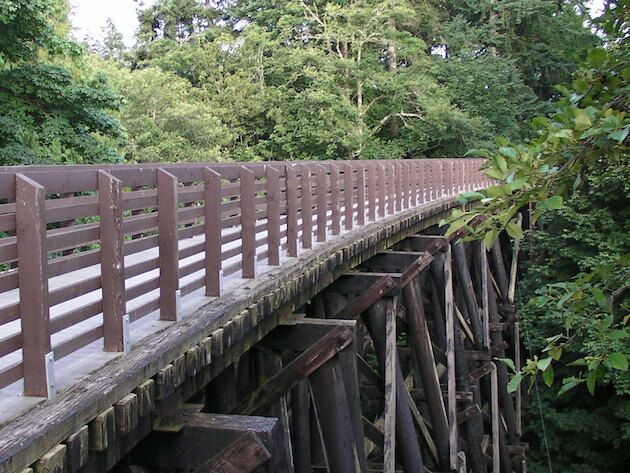 Thanks to the Jamestown S’Klallam Tribe, volunteers with the Peninsula Trails Coalition, and many others, the rebuilt trestle at the end of Leg 12 was ready for action just a year later. 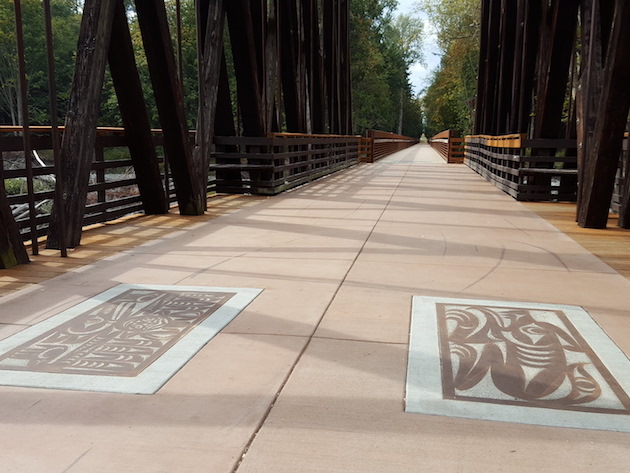 Check out the beautiful S’Klallam artwork embedded on the walkway. Cutoff Alert: Teams finishing this leg after 8:00pm will be sent directly to the finish line party. Surface: Paved ODT, city sidewalks. 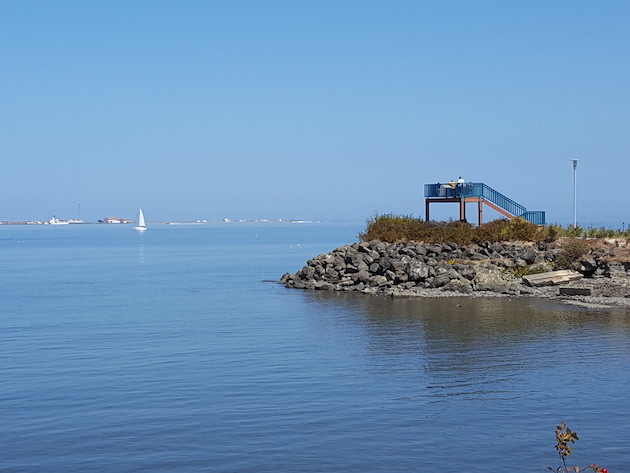 Highlights: A quick jaunt through Sequim (pronounced “Squim”), home to the annual Lavender Festival, Olympic Birdfest, and a retiree mecca, thanks to its location in the rainshadow and its walk/bike-friendly streets. Traffic Alert: Lots of street crossings. Watch for course markings. 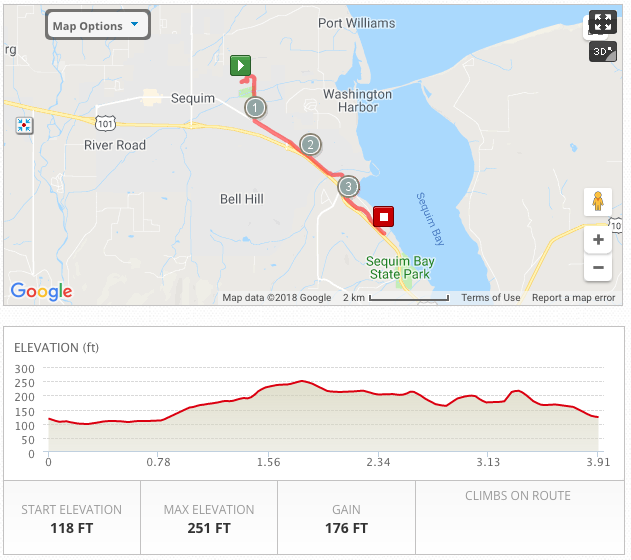 Leg 14: Sequim East. Almost There! Highlights: Begin in Carrie Blake Park. If you’re lucky (and if it’s still light out), the local elk herd will make an appearance along this stretch. Terrain gets a little rolly and the tall trees reappear as you head toward Blyn. Traffic Alert: End of this leg/beginning of next is at a road crossing. Leg 15: Finish Line in Blyn! Highlights: Last leg! 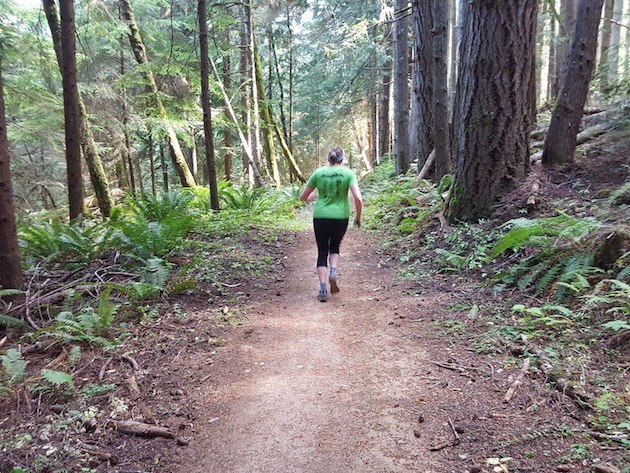 Recap the day with tall evergreens, another restored railroad trestle, a dash through Sequim Bay State Park, open prairie, a lovely net downhill grade, and the finish line after-party in Blyn at the Jamestown S’Klallam Tribe facilities! Way to go, Frosty Mossers! You did it!